The half life calculator is a tool that helps you understand the principles of radioactive decay. You can use it not only to learn how to calculate half life, but also the initial and final quantity of a substance or its decay constant. This article will also present you with the half life definition and the most common half life formula. Each radioactive material contains stable and unstable nuclei. Stable ones don't change, but the unstable undergo radioactive decay, emitting alpha particles, beta particles or gamma rays. Stable nuclei are created in this way. Half life is defined as the time required for half of unstable nuclei to undergo this decay. Each substance has a different half life. For example, carbon-10 has a half life of only 19 seconds, making it impossible for this isotope to be encountered in nature. Uranium-233, on the other hand, has the half life as high as 160 000 years. This term can also be used more generally to describe any kind of exponential decay - for example, the biological half-life of metabolites. λ is the decay constant (rate of decay). Determine the initial amount of a substance. For example, N(0) = 2.5 kg. Determine the final amount of a substance - for instance, N(t) = 2.1 kg. Decide how long did it take for that much of material to decay. Let's say it took 5 minutes. 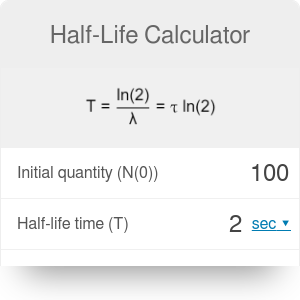 Input these values into our half life calculator. You will get a result - in this case, half life is equal to 19.88 minutes. You can also check the result using the half life formula. Confused by exponential formulas? Try our exponent calculator. Half Life Calculator can be embedded on your website to enrich the content you wrote and make it easier for your visitors to understand your message.